Polish striker Krzysztof Piatek has joined the club from Genoa. Krzysztof Piatek has joined AC Milan. 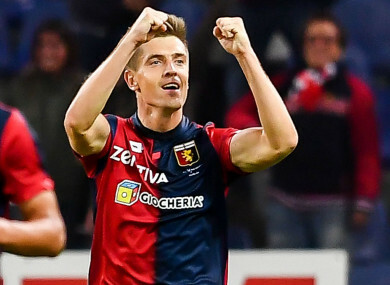 AC MILAN HAVE confirmed the €35 million (£30m) signing of Krzysztof Piatek from Genoa. The 23-year-old striker has signed a contract at San Siro through the 2022-23 season and will be presented to the media on Thursday. The move was announced just minutes after Chelsea confirmed that Gonzalo Higuain joined the club on an initial loan deal with a purchase option. Piatek will replace the Argentine, who scored eight goals while spending the first half of the season on loan at Milan from Juventus. The Polish striker rose to prominence this season, having scored 19 goals in 21 games for Genoa while drawing comparisons to his countryman Robert Lewandowski. The forward spent just a half season with Genoa, having only joined the Serie A side last summer from KS Cracovia in Poland for a reported fee of €4m. Piatek also became a full Poland international this season, having made his debut for his country in September 2018. Milan currently sit fourth in the Serie A table, 22 points back of runaway leaders Juventus. Piatek could make his Milan debut in a crunch clash with second-place Napoli on Saturday. Email “AC Milan secure €35 million Higuain replacement”. Feedback on “AC Milan secure €35 million Higuain replacement”.